Shane Jonas was born in Dallas, Texas on July 25, 1979 into a musical family. Encouraged by his talented mother, a noted church pianist and vocalist, and his father, a bassist and vocalist, Shane showed a unique talent for music at an early age. He began playing the piano at the age of 5. At the age of 8 he began playing the drums in his church, and by the age of 12 he received his first trumpet and excelled rapidly. He continued to blossom as a young musician, gaining recognition throughout the North Texas area, and at the age of 15 he began to play the bass as well as tour as a vocalist with various gospel groups. 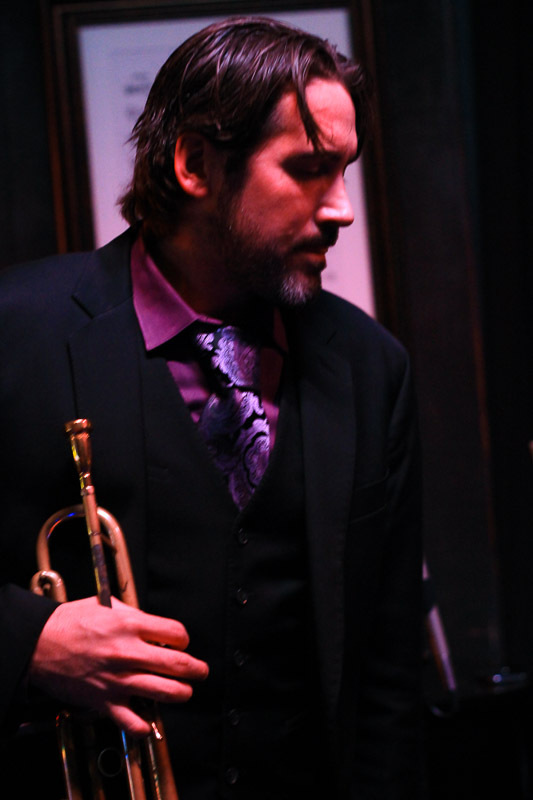 Upon arriving in Chicago, Shane began to earn notoriety as a jazz soloist and band leader. Forming the Shane Jonas Quartet as well as a sextet called the New Direction Organization. In 2003 Jonas became a founding member of the Lowdown Brass Band, a permanent fixture in the Chicago music scene. Never allowing himself to be boxed in by genres, Shane began to gain respect as a vocalist and lyricist in the Chicago area. In 2004 he joined the jazz funk fusion band Spare Parts where he received high praise for his soulful melodic voice and dynamic stage presence. In 2006 he collaboratated with the Chicago Hip-hop group Ben-Sity. In 2009 Jonas founded the Chicago soul group the NDO, and became a member of one of Chicago’s most respected roots reggae groups, Akasha. 2012 proved to be a exciting year as he became the trumpet soloist for Radio Free Honduras, a latin-folk rock group in Chicago, as well as joining Mike Gallagher’s band Higher Order, and live house band Zombies in the Basement. Shane has had the great pleasure of sharing the stage with many distinguished performers including: Lenny Picket, Snoop Dog, The Wailers, Keith & Tex, Johnny Osbourne, Carlton Livingston, Charley Originaire, Kymani Marley, Lee “Scratch” Perry, Niney the Observer, 2 Live Crew, Wycliffe Gordon, Jasmine Sullivan, Bobby Brown, Johnny Gill, Soul People, Bonarama, JT & the Clouds, Po Girl, The Drastics, Birds of Chicago, Ted Sirota’s Heavyweight Dub, and Illuminati Congo to name a few. Shane has toured nationally throughout the United States, as well as internationally throughout Europe and South America including performances at the Montreux, Vienna, and Lima jazz festivals. A prolific writer, he has been the leader of two albums, and a sideman on over a dozen others. Shane continues to challenge himself as an artist to be creative and share the life changing power of music to anyone willing to listen. He has also committed himself to education and the ability it has to empower children. Shane currently works for Chicago Public Schools in the Lawndale neighborhood on the troubled streets of Chicago’s west side. His passion and love for music manifest itself in his unique ability to connect with students.